First, there was a a lot of confusion about Robert's brown sweater, so I'm going to clear up that order of business, right now! ;) It really wasn't "brown" but light tan. As many of you already know, I’m an Edwards supporter, so I attend a lot of events in North Carolina where Senator or Mrs. Edwards will be appearing. In fact, I vlogged one of the campaign events Edwards did for Shuler and the event where Edwards stumped for Kissell. But, I hadn’t really planned on going to the Hardball event until I got a call letting me know that there were a few VIP tickets available for bloggers. VIP tickets for bloggers? Hmmm…that was something I thought I shouldn’t pass up, but reinforce with the Edwards’ camp that we, bloggers, are ready to take our place at the table. Senator Edwards to Campaign for Heath Shuler on Oct 20! On Friday, October 20, Senator Edwards will campaign for Heath Shuler NC-11! Read more about Senator Edwards to Campaign for Heath Shuler on Oct 20! Please get the word out for Larry Kissell on this DailyKos diary! NC-08 VLOG: Edwards Stumps for Kissell! Read more about Please get the word out for Larry Kissell on this DailyKos diary! John Edwards to stump for Larry Kissell on Friday! John Edwards will stump for Larry Kissell tomorrow evening in Concord, NC! 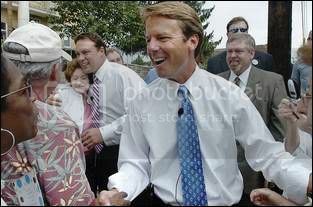 What: John Edwards will visit Concord to support the next congressman for the 8th District, Larry Kissell! Where: The meeting is in the High School parking lot, look for the yellow balloons. Larry Kissell is the "Real Deal" and will help us take our country back! Read more about John Edwards to stump for Larry Kissell on Friday! 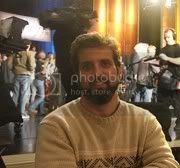 Heath Shuler blogging live right now on DailyKos! Be sure to check out the video of the interview with Screwie Hoolie! Read more about Heath Shuler blogging live right now on DailyKos!